Lisbon Zoo opened in 1884, and moved to its current location in 1905. Receiving more than 800,000 visitors a year, the zoo holds around 2000 animals from over 300 different species and is one of the city's major family attractions. The zoo's primary focus is the conservation of endangered animals, both within its own boundaries and in natural habitats around the world. It partners with several universities and research institutes, and implemented a fund in 2005 which it uses for both ongoing and emergency conservation programs in Portugal and elsewhere. Highlighted programs include the reintroduction of black rhino, oryx, and leopards into their natural habitat, and rescuing South African penguins from an oil spill. 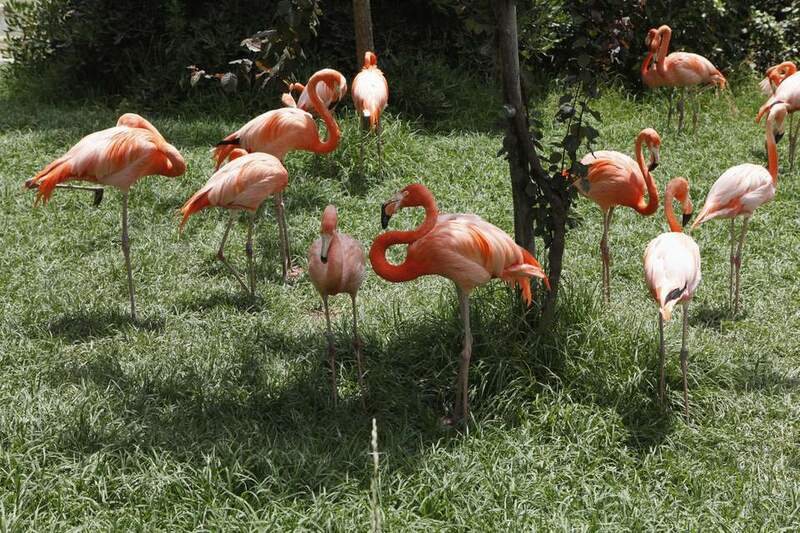 The zoo is designed around a range of different habitats, with rare and unusual animals in each. The highlights of the rainforest area are undoubtedly the gorillas and Sumatran tigers, while you can expect to see elephants, lions, giraffes, and more in the dry African savannah section. A dolphin enclosure puts on three shows a day, while other marine life at the zoo includes pelicans, penguins, and hippo. There's a reptile enclosure that includes alligators, snakes, and large lizards like the Komodo dragon, while lemurs, chimpanzees, meerkats, and crocodiles can be found elsewhere. A small enclosure lets visitors get up close to several types of baby animals, including calves, lambs, miniature pigs, and others, and is ideal for kids (and adults) who may otherwise not get much exposure to farmyard animals. One of the highlights of Lisbon Zoo is its cable car, which lets visitors get a different perspective of many of the exhibits and the city beyond. A journey takes around 20 minutes, with children under the age of 12 needing to be accompanied by an adult. There are no seats, so expect to stand for the duration of the ride. Note that the cable car is closed for maintenance for one day near the start of each month, as well as a six-week period in February and March. Check the website for exact dates, and try to plan your visit for a different day if possible. Back at ground level, a small train loops around the majority of the enclosures, offering a leisurely alternative to walking in the summer heat. Adult tickets to the zoo cost 22 euros , while you'll pay 14.50 euros for children aged 3–12, and 16 euros for seniors. Children under three are free. The fee covers access to everything except the train, which requires a separate ticket. Online sales are available via the website and include a 5 percent discount. Discounts are also available through some of the higher-end hotels in the city. Lisbon Zoo is open every day of the year from 10:00 a.m. From March 21 to September 20, it closes at 8:00 p.m., with last entry one hour and 15 minutes beforehand. Gates shut at 6:00 p.m. the rest of the year, with last entry 45 minutes earlier. Re-entry is permitted on the same day. Expect to take a minimum of three hours to explore the zoo, with many visitors spending their entire day there. Note that many of the public demonstrations are dependent on the conditions, and may not take place if there aren't enough people, during bad weather, or if the temperature is below 68 F (20 C). Wear comfortable shoes and bring a stroller if you have small children with you, as the heat and walking distances can be tiring, especially in summer. The zoo has a range of facilities for visitors, mostly located near the main entrance. As well as ATMs, a first aid center, and the obligatory gift shop, there are ice-cream and drink stands and several fast-food restaurants serving larger meals. There's also a family restaurant ("Savanna") with a baby care center and activities for the kids. With long lines at lunchtime, you're best to eat earlier or later if you'd like to avoid the crowds. For those who'd prefer other dining options, it's possible to leave the zoo and buy food in the surrounding area—just be sure to get a re-entry stamp on your way out. If you get your meal to take away, or bring your supplies with you, you can eat at one of the shaded picnic tables instead. Benches, drinking fountains, and toilets are dotted around the complex, and Wi-Fi is available in certain areas. Other than the cable car, there is good access throughout most of the zoo for visitors with limited mobility, and wheelchairs are available to borrow from the ticket office. It's worth arriving early if you wish to borrow one, however, since numbers are limited and you can't reserve in advance. There are no luggage storage facilities at the zoo. Lisbon Zoo is centrally located, around 3 miles from the heart of the tourist area in Alfama, with easy access by metro, train, bus, and road. The zoo has its own metro stop, Jardim Zoológico, on the Azul (blue) line. If you're staying in the historic parts of the city, the most convenient station to start from will likely be Baixa-Chiado or Rossio. A single journey costs 1.50 euros. Unlimited 24-hour passes are also available. The transport hub of Sete Rios is very close to the zoo, and is accessible by intercity trains and local and intercity buses. Driving is also straightforward, with motorway access from both the city and the airport. Paid car parking is available opposite the main zoo entrance, and if you're feeling energetic, free bike stands are also provided. A taxi from Alfama or other parts of Lisbon's old town should cost under 10 euros, and you'll usually pay somewhat less if you use a ride-sharing app. Note that non-taxi vehicles can't pick you up directly outside the zoo entrance, so if you're planning to return home using Uber or Cabify, you'll need to call from a street or two away.